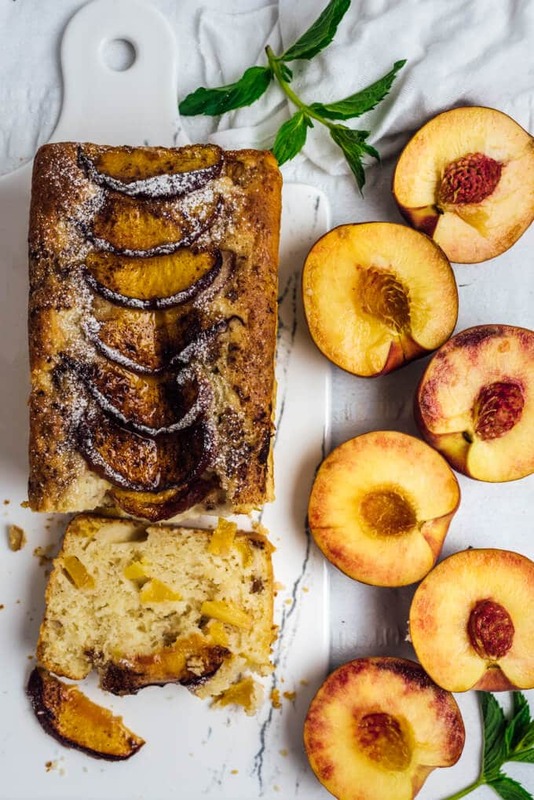 Peach Bread with Walnuts is wonderfully moist and flavorful thanks to fresh peach chunks and cinnamon on its top. No matter how high is the temperature outside, you need to go bake this amazing bread. It is even better when chilled. You might have realized that I’m not much into baking during summer but I wanted to make an exception for this beautiful bread. I mean, don’t you think it looks so attractive? Just as how I had imagined it to be. 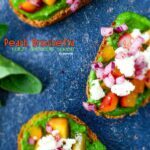 After sharing several amazing salad recipes here since the beginning of summer like Vegan Potato Salad or Watermelon Feta and Mint Salad, I think we all deserve something to spoil ourselves a little. We were talking about the most decadent Banana Bread I’ve ever made the other day. A friend of mine asked me whether I can make it for her daughter’s birthday party and I gladly accepted and made it fort he little beauty. Meanwhile the name “Banana Bread” somehow made me ask myself what other breads I can make when it’s summer time. Well, I know your favorite one on this blog is Chocolate and Yogurt Zucchini Bread. Yes! Zucchini! The vegetable I’m obsessed with! Then I remember peach is one of my favorite summer fruit. 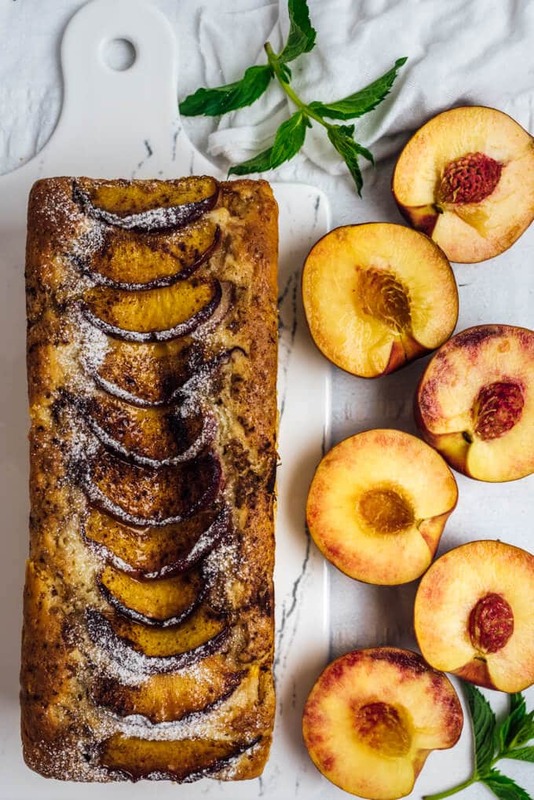 So why don’t make a peach bread? That’s how this out-of-this world bread was born. Summer is when peaches are abundant, so let’s enjoy it! I already add it to salads like this super healthy Cold Lentil Salad with Peaches but I wanted to bake something this time. 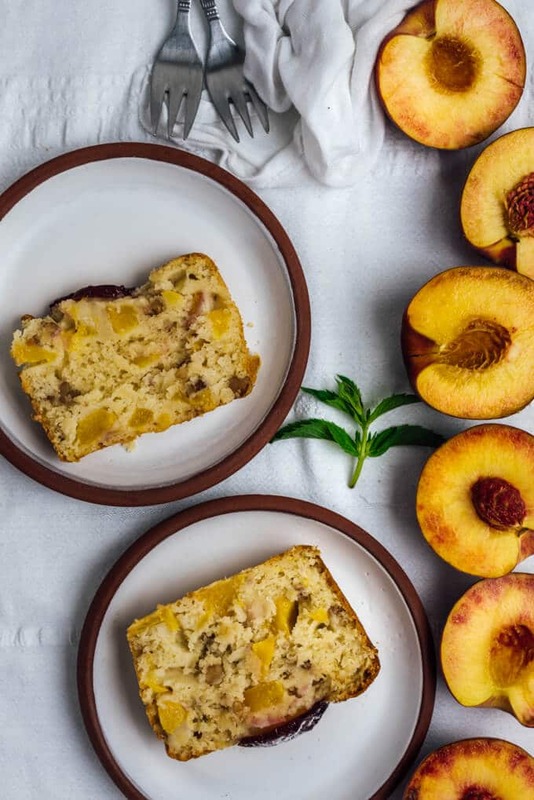 Different from a banana bread, I didn’t mash peaches in this recipe. I chopped them so that we feel the juicy chunks of peaches when eating the bread. So the peaches I used weren’t too ripe. And as I love combining nuts with fruit, I added some crumbled walnuts. I didn’t roast them but if you want their flavor pop more, roast them beforehand. Finally, I topped it with peach slices, that’s what made my bread look so attractive. You know what? Our little son, who loves sprinkling things on food, was with me in the kitchen and he asked “Mommy can I sprinkle some cinnamon on it?” Wow! I was amazed! Isn’t it a brilliant idea? In addition to cinnamon, I added little brown sugar on peaches and ended up this beautiful thing! Cinnamon flavored peach bread with walnuts. Moist and flavorful, it makes you feel cozy. Preheat oven to 350F and line a 8X4 inch loaf pan with parchment, leaving enough baking parchment so that it is easy to pull the cake out. In a large bowl, whisk together the egg and sugar. Add the oil and whisk well. Add in kefir and vanilla extract. Sift flour, baking powder and baking soda together ino the bowl and stir with a spatula just until combined. Stir in the peaches and walnuts and pour into the baking pan. Arrange the peach slices on the bread and sprinkle cinnamon and Brown sugar over it. Bake for an hour or until an inserted skewer somes out clean. Remove from oven and let it cool for 10-15 minutes before removing it from the pan. Dust with powdered sugar when it cools completely or when serving. Thank you Kristi! We’d love to hear what you think when you have a chance to try it. Hope you love it as much as we do. So happy to hear that Maro! That peach flavor is amazing, isn’t it? I would have never thought crumbling biscuits into this. Brilliant idea! What a lovely bread! It looks so moist and delicious with those fresh peaches in. I’d love to try it and it would make a great snack for my kids too – I like to give them snacks with fruit in when I can! Thank you so much! We love fresh fruit in baking and this one has become one of our favorites. Hope you have a chance to try it soon and your kids love it as much as we do. Would love to hear your thought when you try it! It looks lovely Zerrin. Can you tell me please, do you eat this when you would eat cake or more to substitute bread? Do you eat it alone or serve it with something? Cream, yoghourt, butter, salad? How did you serve it? Thank you Lulu! Well, I call it bread because I cook it in a loaf pan, but it’s sweet enough to serve as a cake. I served it as it is with our afternoon tea (and for breakfast next morning), but you can serve it with a glaze on it if you like. Ice cream on its top would be fine as well. Thank you Maro! I’d love to hear your thoughts when you have a chance to try it.